The Metropolitan line is part of the London Underground. It is coloured in TfL's Corporate Magenta on the Tube map and in other branding. It was the first underground railway (or subway) in the world, opening on 10 January 1863 (however, parts of that initial section are no longer served by the Metropolitan line, but by the Hammersmith & City, District and Circle lines). The main line runs from Aldgate in the City of London to Amersham, with branch lines to Uxbridge, Watford and Chesham. For the initial section of the line the rails are in tunnel for much of the way; beyond Baker Street, at Finchley Road the line runs in the open. Out of the 34 stations served, only 9 are underground. It is the oldest line and initially covered the bulk of the Underground system. Today it is the ninth busiest line on the network. The four-track layout for part of the distance — between Wembley Park and Moor Park — allows for the running of express or "fast" services to the outer suburbs. Baker Street is the terminus for some trains, with others continuing into the City to Aldgate. It is the fastest line on the London Underground network - Before the late 1990s/early 2000s, the fast line north of Harrow-on-the-Hill was 70 mph (113 km/h). However, the Metropolitan stock has now been limited to 50 mph (80 km/h) but the stock is still the fastest. Line speeds have dropped accordingly with the majority of the line north of Finchley Road limited to 50 mph (80 km/h), and where National rail services run on the line it is 60 mph (97 km/h). 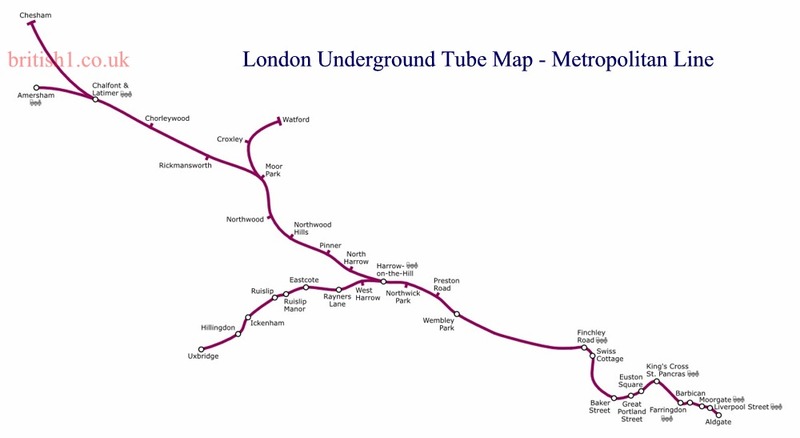 The Metropolitan Line is one of only two lines on the Underground to leave the boundaries of Greater London, the other being the Central Line.